Download "Better planning and forecasting with IBM Predictive Analytics"
2 2 Better planning and forecasting with IBM Predictive Analytics Contents 2 Overview 4 Enhanced planning for finance, sales and more 5 CognosTM1 and SPSS Predictive Analytics integration 7 Conclusion 7 About IBM Business Analytics Overview If you look up forecast and predict in the dictionary, you ll find that the two words mean roughly the same thing. But until now, those involved in financial forecasting have not been able to take advantage of the latest advances in predictive analytics software. IBM Cognos TM1 has long been a leading platform for planning, budgeting and forecasting. And it s used by organizations large and small, from multinational corporations to smaller companies and public sector agencies. Now, Cognos TM1 can be integrated with both IBM SPSS Modeler and IBM SPSS Statistics to help the finance teams at those diverse organizations create plans and forecasts that are more detailed and more accurate than would be possible using these solutions individually. 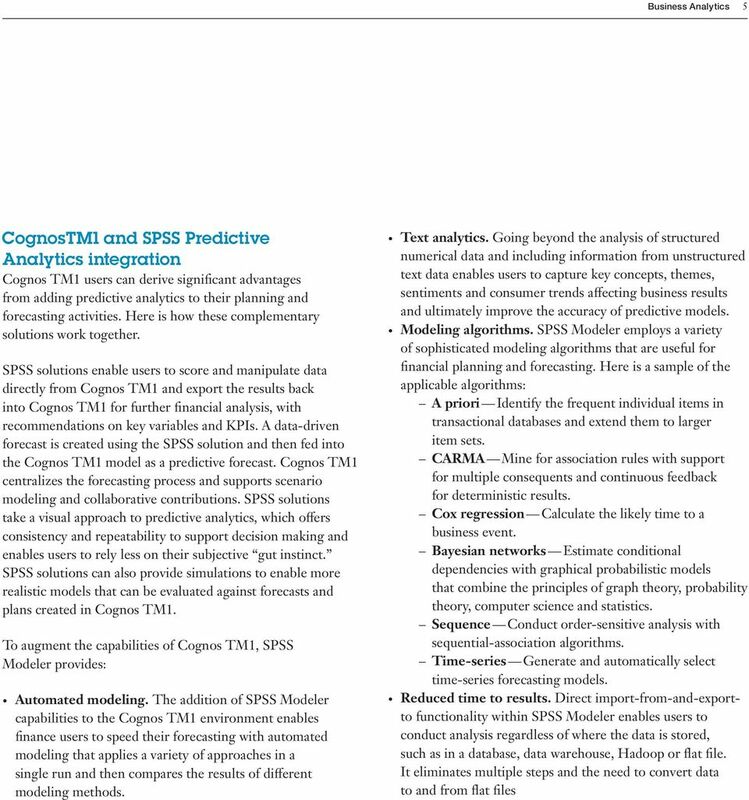 Cognos TM1 can extend the value of predictive and statistical forecasting performed by IBM SPSS solutions by surfacing new insights through its extensive mobile capabilities. This means that constantly on-the-go business professionals can benefit from a more accurate view so essential in today s hyper-competitive business environment. Figure 1: Cognos TM1 provides convenient mobile access to data and metrics. 3 Business Analytics 3 Enhanced planning for finance, sales and more Cognos TM1 provides finance organizations with a wide breadth of capabilities for financial performance management. Along with planning, budgeting and forecasting, Cognos TM1 offers scorecarding, analysis, target setting, what-if scenario modeling and more. SPSS Modeler is a predictive analytics platform that is capable of analyzing both structured and unstructured data in a variety of formats. 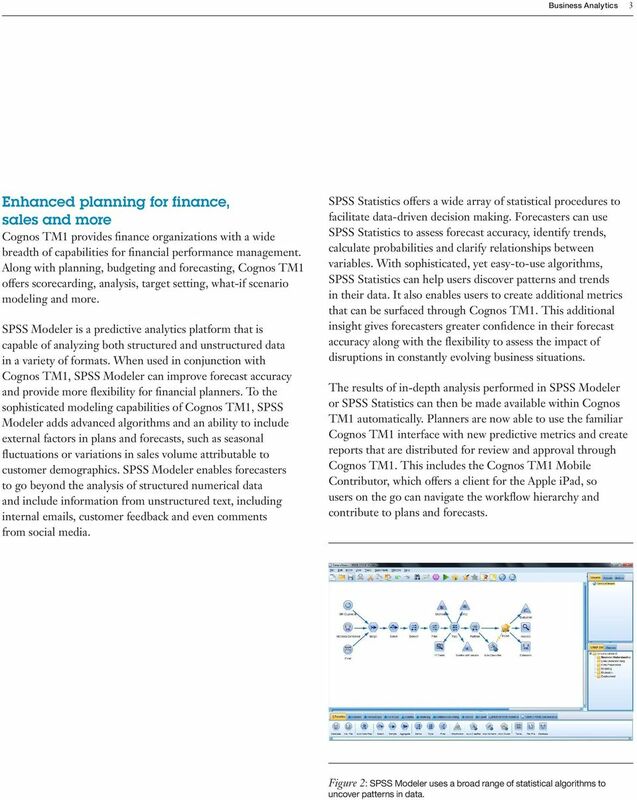 When used in conjunction with Cognos TM1, SPSS Modeler can improve forecast accuracy and provide more flexibility for financial planners. To the sophisticated modeling capabilities of Cognos TM1, SPSS Modeler adds advanced algorithms and an ability to include external factors in plans and forecasts, such as seasonal fluctuations or variations in sales volume attributable to customer demographics. SPSS Modeler enables forecasters to go beyond the analysis of structured numerical data and include information from unstructured text, including internal s, customer feedback and even comments from social media. SPSS Statistics offers a wide array of statistical procedures to facilitate data-driven decision making. Forecasters can use SPSS Statistics to assess forecast accuracy, identify trends, calculate probabilities and clarify relationships between variables. With sophisticated, yet easy-to-use algorithms, SPSS Statistics can help users discover patterns and trends in their data. It also enables users to create additional metrics that can be surfaced through Cognos TM1. This additional insight gives forecasters greater confidence in their forecast accuracy along with the flexibility to assess the impact of disruptions in constantly evolving business situations. The results of in-depth analysis performed in SPSS Modeler or SPSS Statistics can then be made available within Cognos TM1 automatically. Planners are now able to use the familiar Cognos TM1 interface with new predictive metrics and create reports that are distributed for review and approval through Cognos TM1. This includes the Cognos TM1 Mobile Contributor, which offers a client for the Apple ipad, so users on the go can navigate the workflow hierarchy and contribute to plans and forecasts. 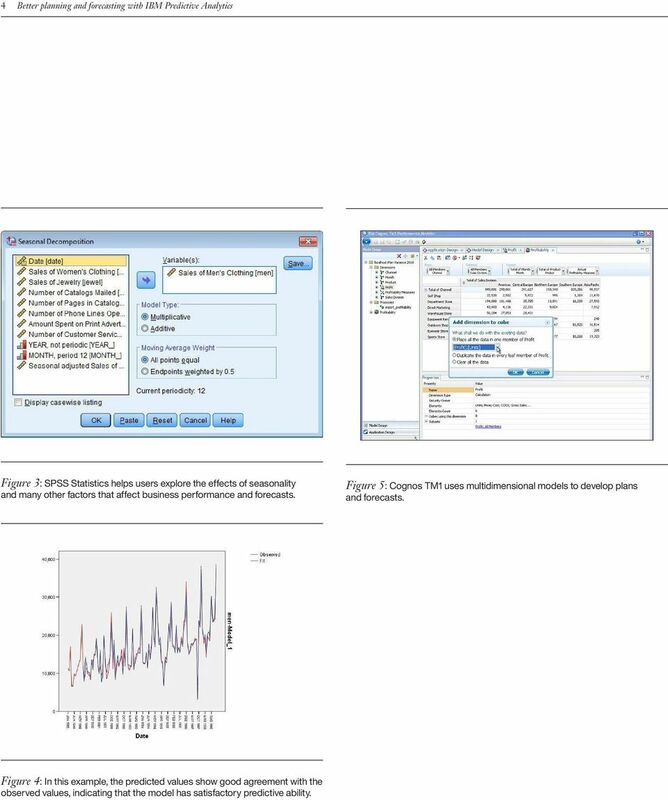 Figure 2: SPSS Modeler uses a broad range of statistical algorithms to uncover patterns in data. 4 4 Better planning and forecasting with IBM Predictive Analytics Figure 3: SPSS Statistics helps users explore the effects of seasonality and many other factors that affect business per formance and forecasts. Figure 5: Cognos TM1 uses multidimensional models to develop plans and forecasts. Figure 4: In this example, the predicted values show good agreement with the obser ved values, indicating that the model has satisfactor y predictive ability. 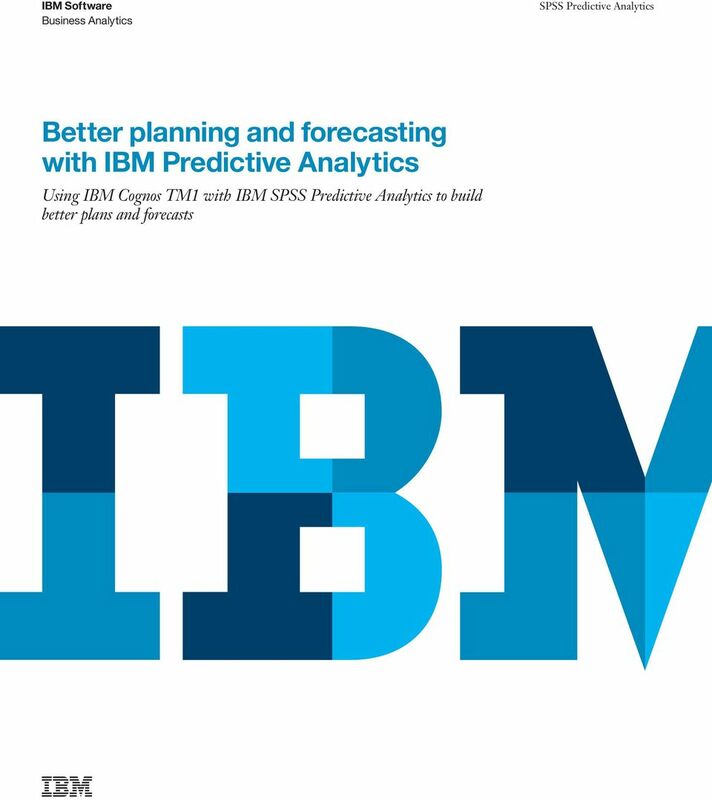 6 6 Better planning and forecasting with IBM Predictive Analytics SPSS Statistics enables users to work with large, complex datasets using the core statistical procedures that business managers and analysts need to address fundamental business questions. With input from SPSS Statistics, Cognos TM1 users can derive meaningful insights by discovering relationships between two or more variables. Categorical and numeric data can be used to predict outcomes, while decision trees make it easier to identify groups and discover relationships between groups. In addition, charts and graphs created in Cognos TM1 make it easy to share compelling visualizations on a range of platforms and mobile devices for users on the go. SPSS Statistics Standard Edition includes the following key capabilities: Linear models, which offer a variety of regression and advanced statistical procedures to describe complex relationships. Nonlinear models can apply more sophisticated modeling to predict categorical outcomes with more than two categories. Nonlinear regression (NLR) and constrained nonlinear regression (CNLR) enable users to estimate the parameters of nonlinear models. Simulation capabilities, including Monte Carlo simulation, enable analysts to model a range of possible outcomes when inputs are uncertain or existing data is inadequate. SPSS Statistics can be used with Cognos TM1 to analyze simulation results and create charts and graphs that can be shared with decision-makers through their mobile devices, along with recommendations for action. Customized tables can help users understand their data and summarize results in different styles for different audiences. An interactive table builder with drag-and-drop capabilities can be used to create pivot tables that are exportable to Microsoft Word, Excel, PowerPoint or HTML for use in reports. 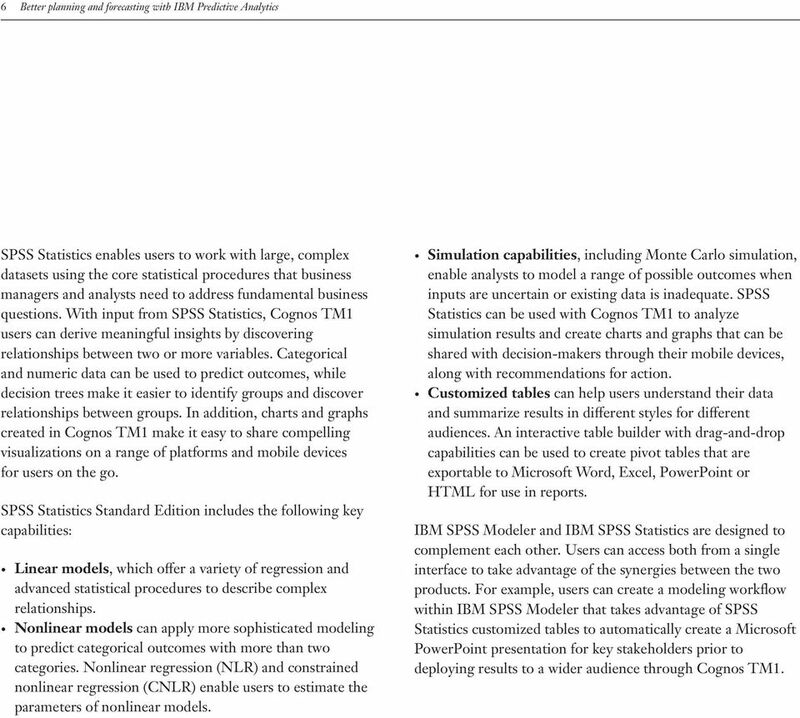 IBM SPSS Modeler and IBM SPSS Statistics are designed to complement each other. Users can access both from a single interface to take advantage of the synergies between the two products. For example, users can create a modeling workflow within IBM SPSS Modeler that takes advantage of SPSS Statistics customized tables to automatically create a Microsoft PowerPoint presentation for key stakeholders prior to deploying results to a wider audience through Cognos TM1. 7 Business Analytics 7 Conclusion Adding the capabilities of SPSS Predictive Analytics to the powerful Cognos TM1 planning, budgeting and forecasting solution gives users a competitive edge over organizations that limit themselves to more simplistic forecasting methods. The intuitive SPSS interface can accommodate the needs of a wide range of users. From non-technical business users to statisticians, data miners, data scientists or financial analysts, SPSS solutions enable novices and advanced users alike to begin uncovering results almost immediately. And thanks to the mobile capabilities of Cognos TM1, the results of that analysis can be shared with stakeholders and decision-makers through their mobile devices whenever and wherever their business takes them. 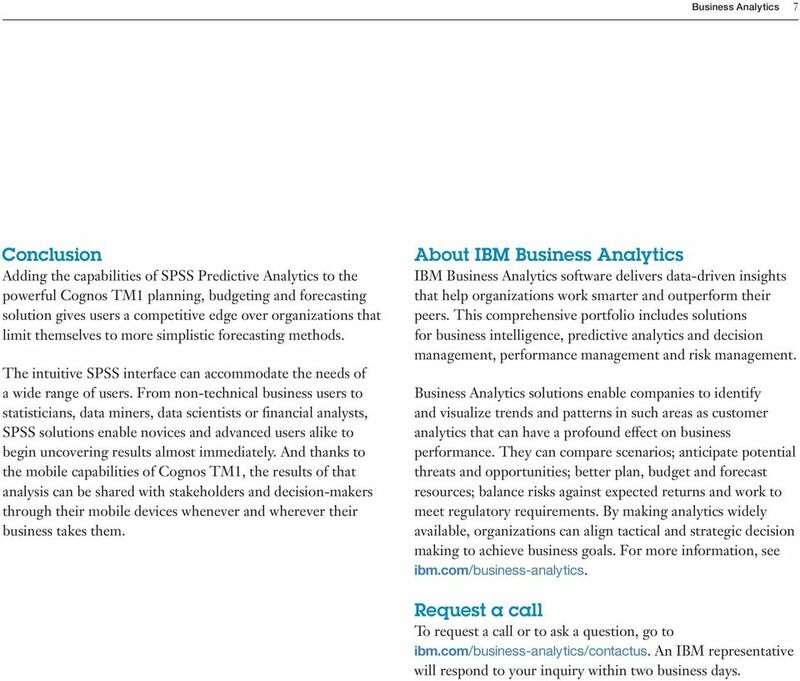 About IBM Business Analytics IBM Business Analytics software delivers data-driven insights that help organizations work smarter and outperform their peers. This comprehensive portfolio includes solutions for business intelligence, predictive analytics and decision management, performance management and risk management. Business Analytics solutions enable companies to identify and visualize trends and patterns in such areas as customer analytics that can have a profound effect on business performance. They can compare scenarios; anticipate potential threats and opportunities; better plan, budget and forecast resources; balance risks against expected returns and work to meet regulatory requirements. By making analytics widely available, organizations can align tactical and strategic decision making to achieve business goals. For more information, see ibm.com/business-analy tics. Request a call To request a call or to ask a question, go to ibm.com/business-analy tics/contactus. An IBM representative will respond to your inquiry within two business days. IBM Cognos Express. Breakthrough business intelligence and performance management for workgroups and midsize organizations. IBM Cognos TM1. Planning, analysis and scorecarding capabilities to drive personal, departmental and enterprise-wide performance management. Making Critical Connections: Predictive Analytics in Improve strategic and tactical decision-making Highlights: Support data-driven decisions. Reduce fraud, waste and abuse. Allocate resources more effectively.